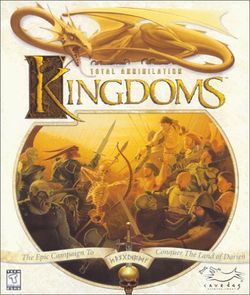 Total Annihilation: Kingdoms or TA:K is a medieval fantasy real time strategy game created and released by Cavedog Entertainment on June 25, 1999. On release, Total Annihilation: Kingdoms reached the top of the weekly game sales chart. While it was the last major title from Cavedog Entertainment, an expansion pack, The Iron Plague, was released in 2000. The game was the anticipated second installment of the Total Annihilation franchise. Although the game was neither a prequel nor a sequel to the original Total Annihilation game, comparisons between the two games were inevitable. There were numerous thematic and design differences between Total Annihilation and Total Annihilation: Kingdoms. These changes included a more in-depth storyline (told with cutscenes between missions), a change from a futuristic setting to a fantasy setting, simplified resource-management, an additional two sides to play, a unified campaign trail that had the player playing all the sides throughout the game, and a massive increase in difficulty. This page was last edited on 16 August 2016, at 18:00.